​​iamU is a two-year program in the art and science of meditation and its application to every aspect of your life. Approximately 50 percent of the program is conducted online, so you can study from home and still maintain your job and relationships. The objective of the program is to develop in you the skill and understanding of mysticism that will lead you to the mystical state of "Illumination." You will learn advanced meditation practices that transform your self and your world, and our experiential tests will give you confidence to apply the various energies of Love in your life -- how to heal and transform people and situations by changing the flow of energy within your heart. The reach of your heart can extend to your family, friends, acquaintances, and beyond -- there is no boundary to your heart. The material is drawn from every tradition that honors the heart, particularly those mystics that have actually experienced the Heart of All and left instructions for us to follow. We especially draw on the teachings of Hazrat Inayat Khan, Rumi, Walt Whitman, Shakespeare, St. Francis, the Christian Desert Fathers, and the Egyptian Hierophants. This teaching is interpreted by the living teachers of iamHeart (formerly the Institute for Applied Meditation), Susanna and Puran Bair. iamHeart has developed Heart Rhythm Meditation as a contribution to the emerging culture of the heart. We have always insisted that meditation, the most powerful of all techniques, be applied in very practical ways, advancing our health, relationships and accomplishments in life. A graduate of this training will have understood and practiced all the teachings and skills needed to attain the mystical state of "Illumination" in which one radiates light from the heart and operates in life with the experience that "I am a part of all things and all things are a part of me." Courses begin in early September each year, and the Class of 2021 will be our 10th graduating class! Applications are now being accepted. and a peacefulness that permeates their atmosphere to bring peace to others. The curriculum is a training in the three interrelated areas of physical, emotional and spiritual development. Click the titles below to expand and display course content. method is important because it gives us a way of self-regulation - through Heart Rhythm Meditation we can control basic rhythms and physiological parameters like Central Nervous System (CNS) activity, blood pressure, blood pH, heart rate, Heart Rate Variability (HRV), production of stress hormones, immune system triggering, alpha and theta brain-wave creation, and metabolic rate. Controlling the values of these physical parameters has been shown to immediately enhance well-being through emotional awareness, emotional balance, emotional resilience, positive affect, optimism, and enhanced interpersonal relationships. Like all of the eight online courses, this is an experiential workshop conducted online with a certified teacher. It will require 7 to 10 hours a week of reading, meditating and writing. There is a one-hour video conference on the weekend. The essence of a spiritual life is the ability to experience Spirit. In the second course, you will feel and summon Spirit in the four ways that Spirit appears: as the four element energies. As matter is frozen Spirit, the elements are the building blocks of existence, and all growth comes from their activity. Any situation or relationship that's stuck is one in which some of the elemental energies are missing. You will begin to recognize the elements in people and situations, and by turning on these energies in yourself, you'll be able to tune yourself appropriately. Furthermore, you will practice directing the elements of Spirit within yourself, consciously and deliberately, to become a powerful agent of change. But before you wield the power of the element energies, you need to be in a state of internal harmony -- that was the purpose of the first course, in Heart Rhythm Meditation. Knowing that whatever you wish for could happen, do you dare to intervene in Life's affairs? The power of Spirit is unlimited; it is our limitation as instruments of Spirit that restricts its expression. In the third course, you will start to apply the element energies by directing them toward your own heart. We will observe your heart's growth in four dimensions -- we can measure the expansion in your heart's magnetic field, and we will see the dimensions of your heart in your Heart Rate Variability. Most importantly, you will notice changes in your attitude and behavior that correspond to the expanding dimensions of your heart. We want "Living from the Heart" to be practical, helpful and productive. This is not a theoretical state of being; it is verifiable by the changes you create in yourself and those around you. We have seen many examples of fathers, wives and husbands, children and co-workers being changed in ways that express the love, harmony and beauty of their hearts, just by interacting with someone in our program. When you bring Spirit into your heart, the love you experience is also experienced by those around you, almost as strongly as you feel it within yourself. Family systems and organizations change because your heart's energy is greater and more available. In the fourth course, you'll go farther in developing your heart by applying the element energies to healing the old wounds in your emotional and energetic heart. These wounds can be of four different kinds. Some wounds leak energy, leaving you drained emotionally. Other wounds make you numb, or highly reactive, or risk-averse. For each kind of wound, there is a specific way of directing the element energies to your healing. We have had many therapists go through this course and experience a healing of their past that they hadn't felt before, a healing that results in the ultimate form of forgiveness and resolution: gratitude for all your disappointments, setbacks, and even traumas. Everything you've experienced has been a preparation for accomplishing the purpose of your life. Many people feel that they've healed their hearts already, that they have no unfinished business. But we're looking for an extraordinary level of heart purity such that there is no person you avoid, no situation you fear, and no pessimism corrupting your self-image. Your heart is the energy source for your whole being, so before we strengthen the other energy centers in your body, called chakras, your heart needs to be operating like a lamp, able to radiate and energize your other chakras. A specialty of iamHeart is the practice of sharing another's heart. We teach, and you will practice, a specific method to experience within yourself what another person experiences in their heart, mind and body. It's not projection, or imagining what someone feels; you actually take on a different identity and feel the other person's energy and consciousness as your own. The fifth course, in the beginning of the second year of the program, is an experience of the seven centers (chakras) in the energetic body. The ancient chakra system has been updated by mystics over the past thousand years and is now verifiable by scientific instruments. We teach the updated system that places the golden sun in the heart, and pairs each chakra with its complementary chakra. You will learn practices of breath and sound that activate each chakra by causing physical and energetic vibration in the appropriate point in the body. The use of vocalized sound is another specialty of iamHeart, and this method of chanting is introduced in the fifth course. A singing voice is not required -- you will use the physical resonance of your heart as biofeedback, along with audio instruments, to tune your sound to invoke spiritual qualities. The spiritual sounds we use are like keys that operate the physical universe. You will be amazed at how effectively you can change your emotional/energetic state by tuning yourself with sound. This is way beyond self-regulation; this is self-creation. Through the development of the chakras, an individual gains access to the mystical powers of insight and influence. With practice, you will gain an extraordinary energetic capacity and learn to apply your confidence, joy, courage, sensitivity, empathy, communication skill, intuition and connection to the hearts of others. Now with the tools of the Heart Rhythm Meditation, the elements, a purified and energized heart, and the ability to operate the seven chakras, course six applies all this to the accomplishment of a goal that's important to you. The course shows how to choose a goal that is attainable and worthwhile, using the guidance of your heart, and then, how to accomplish your goal by spiritual means. The methods of manifestation of the great masters are shared here and put into practice on your own goal. Certainly, the power of intention is used in this process of manifestation, but it is only one of the six Basic Powers we apply. It would not be possible to operate reality as effectively without the mastery of the energetic fields that you have built up by this point. The seventh course explores the unseen universe beyond the levels of individuality. The four levels of an individual are the soul, heart, mind and body. Beyond these four are the three levels of the Universal Heart, the Universal Soul and the Absolute. All seven levels constitute your Self. Our aim is to integrate and operate all these levels as we pursue the purpose of our lives. Using the advanced meditations that are given here, you will learn to navigate in the invisible space-time of universal consciousness. The teachings and methods of the great mystics about the nature of reality will trigger a memory of the time before life and a preview of the time to come. You have entered the university of the Heart to find the Truth, and you will be rewarded with the experience of your True Self. The last course is about helping to transform the culture from mind-based to heart-centered. As we are each co-creators of the manifested world, our effect on the life around us can be powerful and profound. Our aim is to reconstruct the physical world in accordance with the template of its design in the spiritual world. The vehicle for this transformation is the human heart; as people center themselves in their hearts, they transform their lives, with the effects radiating into the hearts of others. 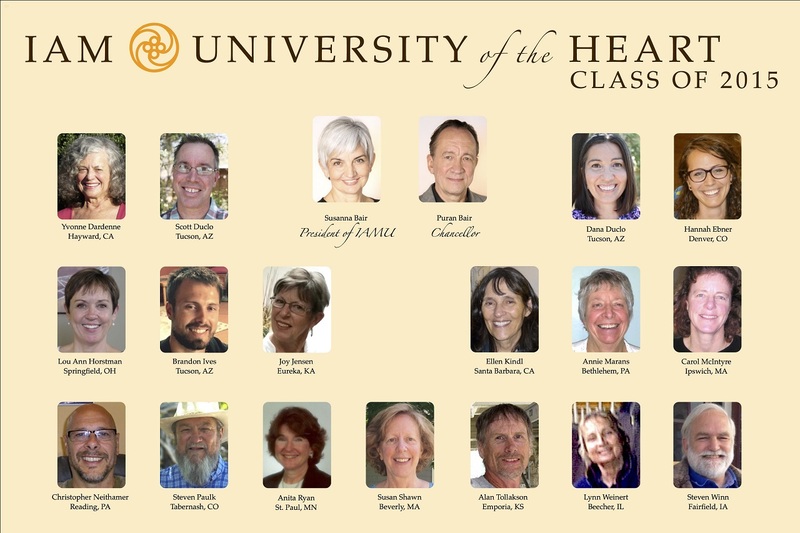 One group retreat a year can be chosen from the four to five retreats that are offered each year in Arizona, California, Taiwan, and in the U.K. All of these retreats are led by Susanna and Puran Bair and other iamHeart teachers. 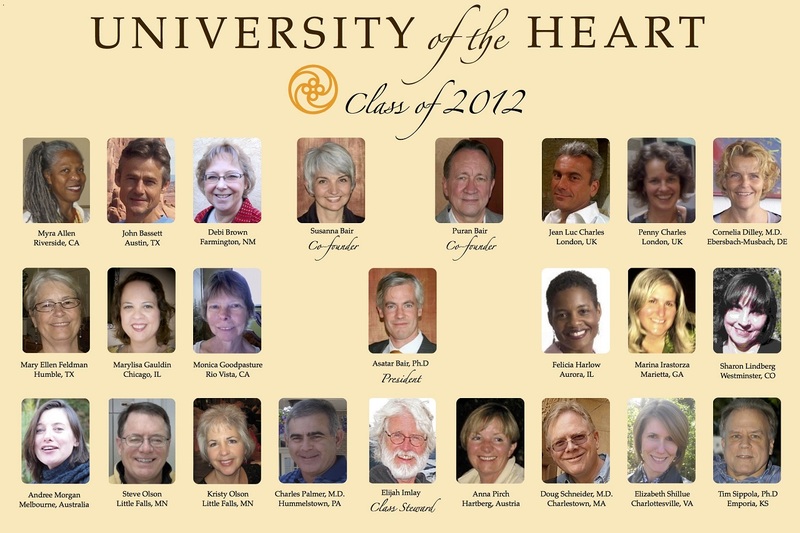 The group retreat is five days of living, studying and meditating together in a loving community of 30 to 60 people. Group retreats are also open to the public. The group retreats are used to immerse ourselves in experiences that are better conveyed in person rather than through the online courses. For example, here we practice the Twelve Archetypes, the Sounds of the Heart, and Contemplation of another. The retreat is designed to lead one through the nine stages of spiritual development, which the retreatant will experience consciously or unconsciously. This is the way to experience the inner world, and its reflection on the outer world, as a mystic experiences the reality of matter, light and vibration. 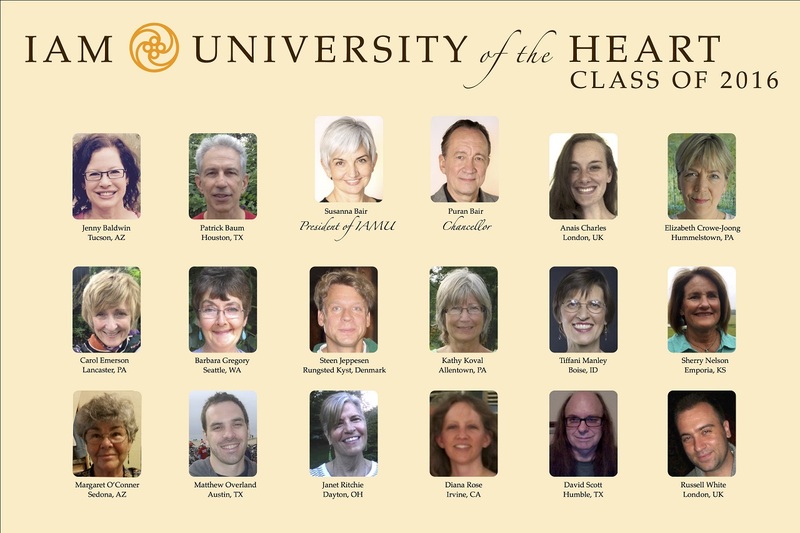 Private retreats are offered at several locations around the US, Canada, Taiwan, and the UK, in the home of an iamHeart Retreat Guide. Mentoring is conducted over the phone, in person, or via video conference in one-hour sessions. The certified mentor knows the iamU curriculum of personal and spiritual development and can help the student individualize the program to his or her needs. 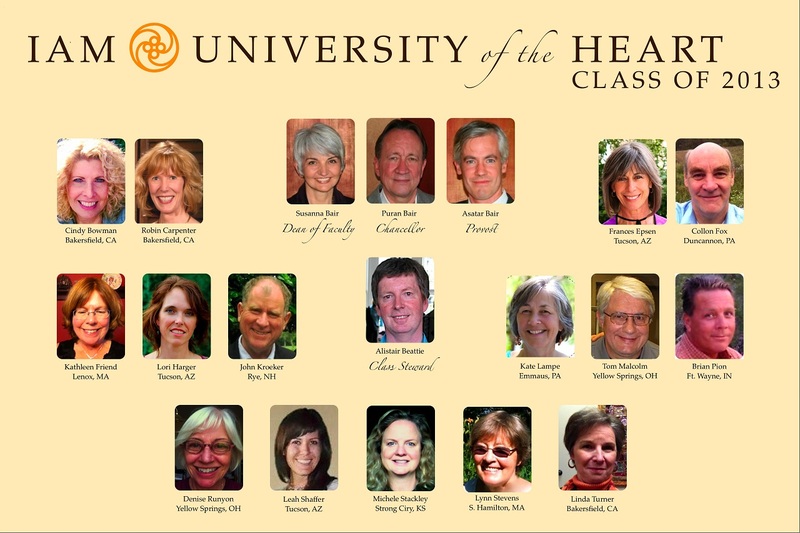 The Residencies are held in a retreat center in Tucson, AZ each summer. They are not open to the public; they are attended by the founders, teachers, and mentors of iamHeart, the graduating class and the next-year's class, and it is the first iamU meeting for the new students. This is a community of approximately 100 people. In the Residencies, we review the material of the last four online courses, and practice applying the meditations to each other. We also experiment with tests of the skills of the mystics, like being able to regulate the metabolic rate and circulation patterns, distinguish poison from food by meditation, change the pH of water, and demonstrate coherent Heart Rate Variability. The graduation ceremony and gala celebration occur at the end of each Residency Program. iamU is an advanced 2-year training in heart-centered meditation that accelerates spiritual experience, healing, and transformation. 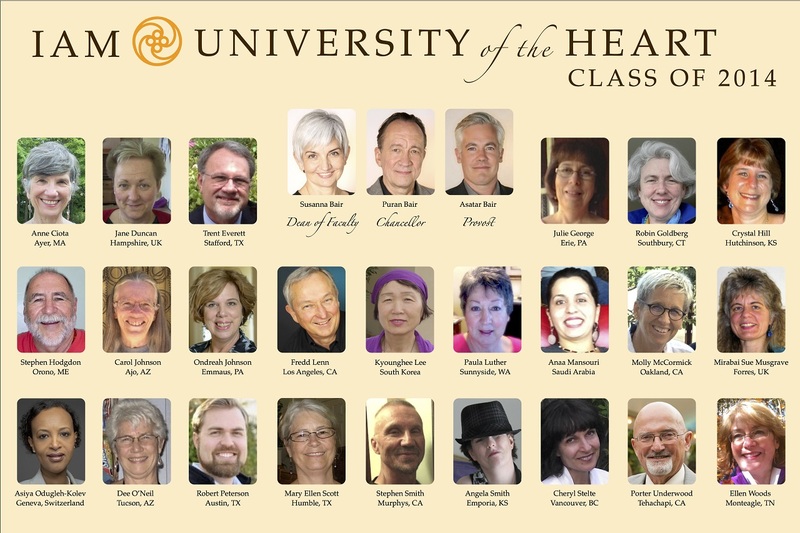 Apply today and become a leader in the holistic spiritual work that is transforming the world.